The Largest Treadbelt We’ve Ever Seen on a Treadmill! If you are looking for an incline trainer with all of the bells and whistles, NordicTrack has you covered with the Commercial x32i. This model has everything we love about their Incline Trainers with some big upgrades in the technology department. As with all of the Incline Trainer models, the Commercial x32i is going to provide you with a quality workout just by walking. Thanks to the steep incline on these machines, you don’t have to be pounding the pavement to put in the work. This means you can get a killer cardio session with little to no impact and stress on your joints. The NordicTrack Incline Trainers are extremely popular machines brought to you by parent company Icon Fitness. Icon is the largest maker of fitness equipment in the world including ProForm machines. This means they are often able to build higher spec machines with a lower price tag as compared to other brands. MID-WEEK SALE ENDS THURSDAY: The NordicTrack Commercial x32i Incline Trainer is reduced to $4,299 with FREE Shipping. Financing is available. For a much lower pricetag, you may want to check out the x22i or x15i Incline Trainers. 4.25 Continuous Duty HP Motor – NordicTrack loves to put monster motors on their machines. The huge 4.25 CHP motor means that this machine can handle anything you are ready to dish out. The extreme inclines on these machines require a motor that can keep up and this one definitely does the trick. 22” x 65” Treadbelt – This is an upgrade that will have your workout feeling comfortable and never cramped. The other incline trainer models sport a 60” length on their treadbelts. But the Commercial x32i boasts an additional 5 inches of length. Even the tallest of users will find that they are able to use this comfortably, without ever worrying about a long stride. With some of the other incline trainers, buyers have complated that they lose 5″ of length when the deck is lowered. This is because part of the deck lowers underneath the console. You won’t have a length issue with the x32i Incline Trainer. Quite frankly, this is the LARGEST treadbelt we’ve ever seen on a treadmill. 2.5” Precision and Balanced Non-Flex Rollers – The larger rollers on the Commercial x32i will keep your machine running smoothly for longer. Larger rollers mean that there is less wear and tear on the machine, which means less maintenance for you. 40% Incline – The giant 40% incline on the Commercial x32i is the reason this machine delivers a killer workout. You don’t need to be doing anything other than walking at these extreme inclines to get your heart pumping and your muscles firing. These incline settings are the same on the other incline trainers. -6% Decline – Anyone who has ever walked or run down a hill knows that this makes a world of difference. This decline allows you to work a whole different set of muscle groups than walking on a flat surface or propelling yourself uphill. 32” Smart HD Touchscreeen – As expected, we see a major upgrade in the technology department with this massive 32” HD touchscreen. This is the largest screen found on any cardio fitness equipment that you are going to find. In fact, some other machines have a very small screen that is hard to view. You won’t have this problem with the x32i Incline Trainer. The crystal clear graphics and interactive technology make for an even more immersive experience when used with your iFit subscription. Most of the price tag on this machine is due to this large touchscreen. 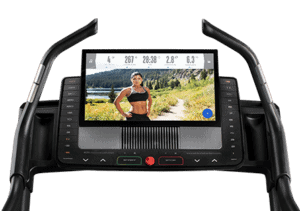 If you are happier with a smaller screen, check out other models in the Incline Trainer Series. iFit Technology – iFit allows you to get the most out of every minute that you spend your machine. Start with a custom designed progressive workout routine to help you build your progress each time you step on your incline trainer. Each session is led by a professional trainer to keep you motivated and provide fantastic results. Create and follow your favorite routes using Google Maps. The incline and decline features on the Commercial x32i will simulate the terrain on each and every route to give a more real-road feel. Why take in the scenery of your four walls when you can choose the scenery anywhere in the world. You’ll be able to choose landscapes and city-scapes from around the globe with NordicTrack’s extensive library of videos. Just like the Google Maps routes, your Commercial x32i will simulate the terrain so you’ll feel like you’re there. Please note that this model come with a free 1-year subscription. After your initial year, this is a paid subscription service. 50 On-board Workout Programs – If the idea of paying for a subscription service isn’t really something you’re looking to do, you are not without options. The Commercial x32i comes with 50 pre-programmed workouts so you’ll have plenty of workouts to keep you moving if you choose to forego iFit. Choose your workouts based on your needs and you’ll be reaching your fitness goals in no time. This is an upgrade from the 44 pre-programmed workouts on the other incline trainer models. Next-Gen Sled Push – If you’re looking to incorporate something new into your workout on the Commercial x32i, try a sled push workout. The addition of the sled grips and push bar make it easy to do this whole body workout in your home. A sled push involves pushing a weighted sled and set distance along the ground and requires your whole body to do. With the Commercial x32i Incline Trainer all you need to do it place your hands in the set position, set your speed to 1 mph and reap the benefits of this intense workout. Warranty – NordicTrack puts their money where their mouth is with this impressive warranty. Lifetime frame and motor, 6-year part and electronics and 3-year labor. Quality and Durability – Reinforced steel construction and a 300 lb. recommended weight limit mean that most everyone can work towards their fitness goals and discover their healthiest selves with the Commercial x32i. Other Features – Two 3” digitally amplified speakers and dual fans ensure comfortable use, and OneTouch Controls make for easy transitions in speed and incline. Out-of-the-box Easy Assembly will have you using your machine faster without any struggle. 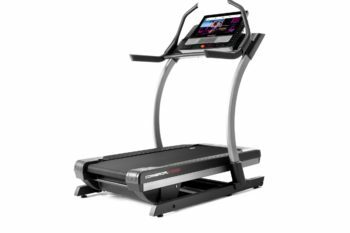 We have said before that we love the Incline Trainer series from NordicTrack and the Commercial x32i doesn’t change that opinion. With all of the exceptional features that we have come to expect from these machines, there’s no doubt that it provides a fantastic workout with no impact on your joints, making it a great option for everyone. The 4.25 CHP motor will be able to keep up with any amount of work you’re putting in and the lifetime motor warranty backs that up. In addition, the extreme 40% incline and -6% decline will have you working all of your muscles groups for a full-body experience not found on other machines. If you are debating between the different models in the incline trainer series, the place to look is the technology. The only major difference between the Commercial x32i and the Commercial x22i is the size of the touchscreens. The 32” screen on the Commercial x32i is huge, there’s really just no other way of putting it. However, the 22” screen on the x22i isn’t exactly small. It’s really a matter of whether the giant screen is worth $1,300, because that’s the difference in price you’ll be paying. What it ultimately boils down to is what you want in the technology department. If you are going to be using the programs available through iFit and want the most immersive experience possible, the 32” screen with deliver that. If you are more focused on your physical results, you can save yourself a considerable amount of money and get the same benefits. You may also be interested in the NordicTrack Commercial x22i Incline Trainer or other NordicTrack Incline Trainers. 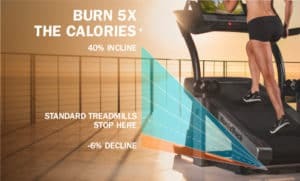 See a comparison chart with all of the NordicTrack Incline Trainer models here. Go to www.NordicTrack.com to learn more! Video recorded at NordicTrack corporate headquarters! A Cardio Workout That’s Hard to Beat! When it comes to a fantastic cardio workout that’s low impact, it’s hard to beat the NordicTrack Incline Trainers. 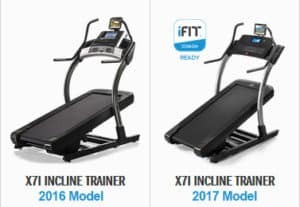 With more models being added to the NordicTrack Incline Trainer line-up, you’re sure to find the model that is perfect for you. One such example is the x15i Incline Trainer, which is a new release for 2019. With the quality and durability that we have come to expect from NordicTrack, the x15i will provide you with the performance and comfort to make your in-home workout experience a pleasure. You’ll get all of this, plus peace of mind knowing that you have experience on your side. 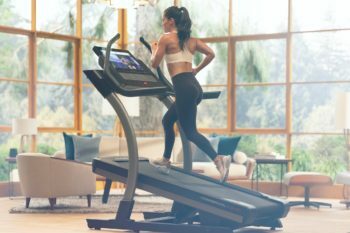 NordicTrack is part of Icon Fitness, which is the largest producer of fitness equipment out there (including ProForm Treadmills.) So you know you’re making a fantastic purchase with their machines. MID-WEEK SALE ENDS THURSDAY: The NordicTrack Commercial x15i Incline Trainer is reduced to $2,499 with FREE Shipping. Financing is available. 4.0 DurX Commercial Plus Motor – The motors on the Incline Trainers models are huge to ensure that you can utilize the incline on these machines without having to worry. At 4.0 CHP, you can rest assured that your machine is always going to be able to keep up, no matter what your workout includes. The self-cooling motor also reduces vibration for a comfortable ride. Next-Gen Sled Push – With this latest version of the incline trainers, NordicTrack has added a sled push feature. Work your entire body by gripping the sled push bar and turning the treadbelt with the power of your legs. It’s a great workout and will have you sweating in no time! Reflex Cushioning – Even though you can get a fantastic workout by simply walking on the x15i Incline Trainer, it is still important to consider your walking surface. The Reflex Cushioning is a great feature that allows you to adjust the firmness of the running/walking surface. You can switch between a firmer, real road feel and a softer surface to reduce any impact. This is great for anyone with joint pain or those that have suffered an injury. 2.5” Precision and Balanced Non-Flex Rollers – This is a larger roller than we see on many machines, which is something that bodes well for you and your machine. Larger rollers mean less wear and tear on the machine, allowing for a longer life and less maintenance for you. 300 lb. User Weight – The high recommended user weight on these machines speaks to the quality construction and materials of the x15i Incline Trainer. These factors combine to create a machine able to withstand larger users, allowing for a wider range of individuals to take advantage of a great in-home workout. 40% Incline – This is where the name comes from, it’s all about this massive incline. This is the feature on these machines that allows you to get a killer cardio workout and train and tone such a wide variety of muscles by simply walking. -6% Decline – In addition to the huge incline on the Commercial x15i Incline Trainer, the -6% decline lets you broaden your workout regimen even farther. Walking or jogging downhill works an entirely different group of muscles and contributes to a truly full-body experience. 22” x 60” Treadbelt – This large treadbelt is another feature that we love to see on the Commercial x15i Incline Trainer. The 60” length makes this an accessible machine for taller users or anyone with a longer stride. Plus, the 22” width will keep you from feeling cramped when you’re focusing on your workout. 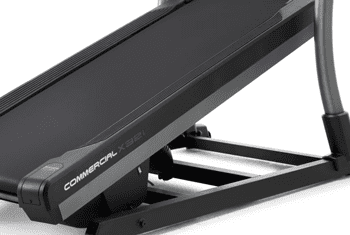 The lower priced Commercial x11i Incline trainer has a 20×60″ treadbelt. 14” Smart HD Touchscreen – The touchscreens on the Commercial x22i and x32i are so enormous that this 14” screen on the x15i feels small. But remember, it’s still a very large touchscreen! And it does exactly the things that you need. This is the feature on any machine that allows you to tailor your price a little bit. Larger screens mean higher price tags, but the size of the screen doesn’t dictate what you can do on it. 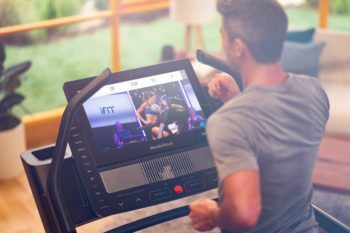 The 14” display on the x15i Incline Trainer still gives you access to all of the amazing features that come with an iFit subscription. Your purchase of an x15i Incline Trainer comes with a 1-year subscription to iFit, but remember, after that it is a paid service that you will need to sign up for. iFit allows you to really get the most out of your machine with workouts, motivation and stat tracking to keep you on the path to your fittest you. You can join a live interactive training session with one of NordicTrack’s world-renowned trainers that will keep you moving from start to finish. The trainer controls your machine and will automatically adjust the speed and incline to make sure you’re getting the best workout possible. If you like to keep things at your own pace a little bit more, you can take advantage of the on-demand video library, filled with workouts to use both on and off your machine. Switch things up with a weight training workout or a yoga routine when you want a little variety in your life. Just because you are working out in your home, doesn’t mean you need to get cabin fever. You can choose routes from around the globe with iFit’s extensive library of video routes. Beat the winter chill with a workout along the beach of a tropical island. The machine will adjust the speed and incline to create an immersive experience. Or create your own route with the help of Google Maps. Again, the machine will adjust incline and speed to create a real-life feel no matter where you choose to be. Warranty – Lifetime frame & motor, 5-year parts & electronics and 2-year labor. Other Features – OneTouch controls allow you to easily make changes during your workout without losing your focus, while the dual AutoBreeze fans will keep you cool. The x15i Incline Trainer also has Bluetooth audio capability and your favorite tunes will sound great coming from the dual 3” digitally amplified speakers. We have come to expect great things from the Incline Trainer series from NordicTrack, and the x15i doesn’t change that in the least. It has the quality, performance and durability that we have come to expect. It’s just a downright snazzy machine! The 4.0 CHP motor is exactly what we’d expect on this machine and it is able to handle the intense 40% incline without losing a beat. You’ll never have to worry that your demanding workout regimen is too much for your machine. And don’t forget that -6% decline. Adding that downhill to your workout will have you finding muscle groups you didn’t even realize you should be working. The 12mph max speed is also in line with what we’d expect on this machine. The speed allows you to incorporate your HIIT workouts and speed training when you are ready to up your game. 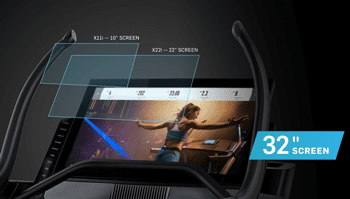 We have talked about all of the awesome features associated with iFit, but it’s nice to see the extensive on-board workout library that comes on the x15i Incline Trainer. Not everyone wants to pay for a subscription service and that’s fine, but it also doesn’t mean you should have to miss out. With 50 pre-programmed workouts, you will be able to find a targeted workout for every one of your goals. The 14” Smart HD Touchscreen isn’t going to be the largest display on the market, but it’s also why you can get the x15i Incline Trainer for a great price. Technology, specifically display size, is what we see driving prices up across the board for fitness equipment. If you want the giant screen, you will be paying for it. However, you can get all of the same technology on a 14” screen and save yourself some serious cash. All in all, the x15i Incline Trainer upholds the quality and performance standards that make these machines a fantastic option for anyone looking to crush their fitness goals at home. The x15i Incline Trainer will not disappoint, ensuring a durable machine and comfortable experience every time you step onboard. 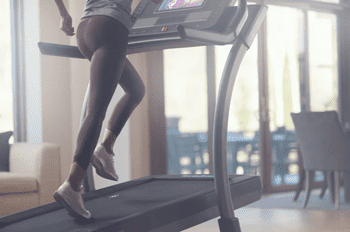 The NordicTrack x22i Incline Trainer and NordicTrack Commercial 2950 Treadmill are both fantastic machines that can help you reach your fitness goals. But which one is right for you? Both of these machines will take up about the same amount of space in your home when in use. The footprint of the two machines is nearly identical in width, but the Commercial 2950 is 79” in length compared to 70.2” with the x22i Incline Trainer. NordicTrack x22i Incline Trainer – Read our full review here. Not all treadmills are created equal. 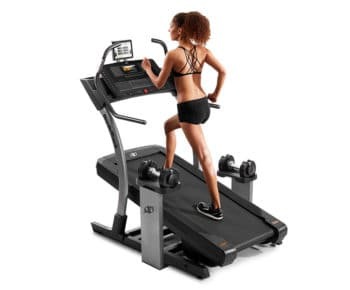 And, the NordicTrack Commercial x11i and Commercial x22i Incline Trainers have a slew of features that put them a head and shoulders above the rest. So, which one is right for you? Read on to find the top reasons we love these machines. Plus, we’ll help you find which model is perfect to help you get in your best shape this season. Nordictrack has introduced the Commercial x22i Incline Trainer. (Please note that this is not the same as the Nordictrack x22i Incline Trainer, which is another model available from Nordictrack. Totally confusing, right?) Anyway, the powerful motor, serious incline and upgraded technology on the Commercial x22i Incline Trainer leave no doubt that this machine is prepared to put in serious work. Like the other incline trainers from Nordictrack, the Commercial x22i Incline Trainer gives you an intense cardio workout with low impact. Our team has reviewed several Incline Trainers and we can vouch for the effectiveness of their workouts. We also found that these machines are a favorite of Nordictrack employees. MID-WEEK SALE ENDS THURSDAY: The NordicTrack Commercial X22i Incline Trainer is priced at $2,999 with FREE Shipping and 1-year FREE iFit Membership. Financing is available.Also see the NordicTrack x22i Incline Trainer. Next-Gen Sled Push – This is going to be the only real difference between the features listed below and those on the x22i Incline Trainer. The Commercial x22i Incline Trainer features the addition of the Next-Gen Sled Push feature. Sled push workouts have gained major popularity for being a full-body blasting workout in addition to your cardio. They involve literally pushing a weighted sled in front of you for a certain distance. Nordictrack has sought to replicate that particular workout on a treadmill. The added push bar and sled grips place your hand and body in position to properly perform the exercise. From there you simply put the treadmill at 1.0 mph and push your workout yourself. 22” Interactive Coaching Smart HD Touchscreen – You read that right, the Commercial x22i Incline Trainer features a 22” HD Touchscreen, which comes in handy for all of the things you will have available on it. With iFit, not only will you have real-time workout tracking and new daily programmed workouts, you will have world-class trainers and live interactive training at your fingertips. Nordictrack allows you to stream over 16,000 on-demand workouts and engage in live training sessions. All of these are interactive in the sense that the trainers digitally controls your machines decline, incline and speed to keep pace with the workout. You can also use these videos for fitness off of the treadmill, with yoga, weight training and sculpting workouts. Pretty cool, right!? If you don’t feel like taking a class, you can use virtual routes from all around the globe to get a change of scenery from the everyday. 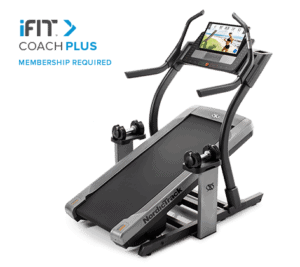 Note that the Commercial x22i Incline Trainer comes with a 1-year subscription to iFit, after which it becomes a paid subscription. 44 Programmed Workouts – Even though we’ve talked about all of the amazing things that come with an iFit subscription, you won’t be stranded without it. The Commercial x22i Incline Trainer features 44 pre-programmed workouts so that you can always find the workout that fits you. 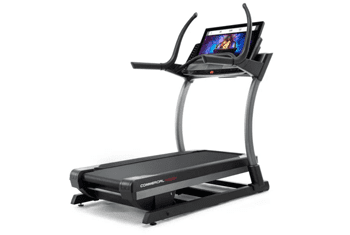 Bluetooth Audio – This upgrade from the x22i Incline Trainer allows you to use Bluetooth to stream your favorite playlist on your device to the speakers on the treadmill. 4.25 CHP Motor – The powerful motor on the Commercial x22i Incline Trainer means that it can keep up with your most intense workouts. While built primarily for walking and jogging for a low impact workout, this motor can certainly handle running at top speeds of 12mph. -6% – 40% Incline – Just like the name implies, this treadmill is built for the incline. At 40%, this is about twice the incline you will get from any standard treadmill. That additional incline means that you will be burning some serious calories. Plus, different degrees of incline let you focus on really strengthening and toning specific muscle groups. The -6% decline also allows you to get a more natural feel when you are doing a run that simulates hills. 60” x 22” Running Surface – This spacious belt is going to provide plenty of room for most any user. While the 60” length is fairly standard in models of this price range, the extra width will keep you from feeling cramped. We’ve seen a disturbing trend of smaller treadbelts (18” width for instance! ), so it’s nice to see NordicTrack embracing this very long and very wide treadbelt for the Commercial x22i. Reflex Cushioning – The Commercial x22i Incline Trainer features adaptive cushioning which activates dampeners to help protect your joints from stress and impact, and can also simulate real road-running. Check out a comparison chart with all of the NordicTrack Incline Trainer models here. Also, see a comparison of the NordicTrack x22i vs the x11i Incline Trainer here. 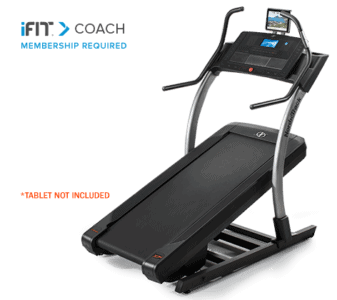 When looking at the Commercial x22i Incline Trainer there are definitely a few things that really stand out. The 4.25 CHP motor means you know you don’t need to worry about putting in the intense miles. The 40% incline is going to give you a fantastic workout while allowing you to keep it low impact and protect your joints. You also can’t help but notice the giant 22” Touchscreen. That’s not to mention the large rollers to reduce maintenance, the spacious running surface and the 44 pre-programmed workouts. These are all incredible features that will certainly provide you with a treadmill to suit your needs, but these are also all features that can be found on the x22i Incline Trainer…for over much less. So what makes the Commercial x22i Incline Trainer so different that it warrants a higher price tag? This comes from the addition of the Next-Gen Sled Push feature. The push bar and sled grips give you the proper body placement to turn your treadmill into a weighted sled push. You hold onto the handles in either of the two predetermined locations, put the speed on 1mph and push your way to a full-body workout. While there is no doubt that the popular sled push workout is effective, we aren’t sure that adding it to your treadmill is worth that kind of cash. If you are interested in the workout that an Incline Trainer can provide and like all of the features on the Commercial x22i Incline Trainer, but can live without doing a sled push, check out the x22i Incline Trainer. You will be getting the same quality construction, the same durability and the same performance for a lower price. You may also be interested in the NordicTrack x22i and x11i for similar quality and a lower price. Video recorded at NordicTrack corporate headquarters! This shows the x11i Incline Trainer in action. UPDATE: Since this article was first published, NordicTrack has decided to revert to their original requirements. As of this update, both the x9i and Commercial 1750 DO require a 1-year iFit subscription with purchase. At the start of 2018, we were disappointed to learn that NordicTrack was changing the requirements for their very popular iFit Coach programming. For some higher end models, buyers were no longer given the option of purchasing a machine without an iFit membership. The newest version of iFit Live includes some excellent features, but overall, we’re in favor of more freedom of choice in your buying experience. So, we were curious how consumers would view these new requirements. NordicTrack x22i Incline Trainer – Read full review here. With all the different models that NordicTrack offers, I often get inquiries on which is the best value. Of course, that depends largely on your budget and how you plan to use the machine. 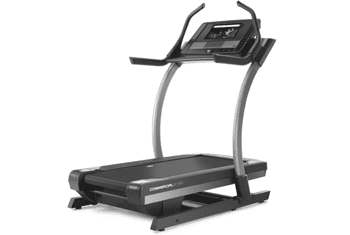 In addition, NordicTrack offers a variety of treadmills, incline trainers, ellipticals and FreeStriders. I also get asked which is the best model within a category. One of the most often asked question is what is the best choice: the NordicTrack x11i or the NordicTrack x22i incline trainers. These are their top two models of the incline trainer line-up. 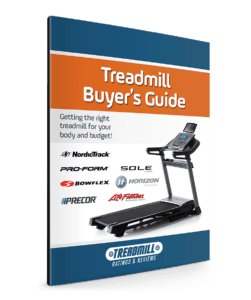 The last time I was at the NordicTrack headquarters in Utah, one of the managers told me of all the fitness equipment available to the employees at a discount, the incline trainer was the top choice. Both the x11i and the x22i are based on a workout that focuses on a steep incline, instead of a running workout on a treadmill. Click here if you are still trying to decide if an Incline Trainer is right for you. Is a NordicTrack Incline Trainer Right for You? It can be hard at times to look past all of the fancy advertising and hype to decide if a treadmill model is truly a good fit. We’re going to take an up close look at the features on NordicTrack Incline Trainers to see if these machines are right for you. NordicTrack recently released the x22i Incline Trainer, their latest model in a popular line-up of Incline Trainers. 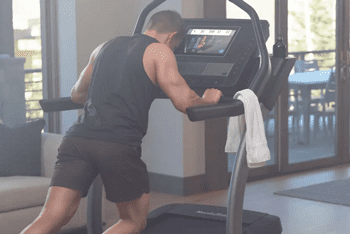 These machines have some unique features that you may find attractive over a regular treadmill. Let’s take a look at some of the top benefits available. NordicTrack’s Most Popular Cardio Machine With a 22″ HD Touchscreen and Sled Push Feature! The popularity of the NordicTrack Incline Trainers is the ability to get a intense cardio workout with a low impact workout. The main advantage for an incline trainer over a regular treadmill is the extreme 40% incline that will help you burn more calories while just walking. The x22i is their top of the line model and offers an enormous 22″ HD Touchscreen Display. More recently, Nordictrack has introduced the “Commercial” x22i Incline Trainer. The powerful motor, serious incline and upgraded technology on the Commercial x22i Incline Trainer leave no doubt that this machine is prepared to put in serious work. Best of all, they added a new “sled push” feature that allows you to simulate pushing a heavy sled of weights while pushing off an unpowered belt. Good stuff! Our team has reviewed several Incline Trainers and we can vouch for the effectiveness of the workouts. On top of our opinion, we know for a fact that NordicTrack employees view these machines as favorites. The NordicTrack incline trainers are primarily for walking and help deliver effective workouts without subjecting your joints to excess stress and strain. They can certainly handle running with a top speed of 12 mph. 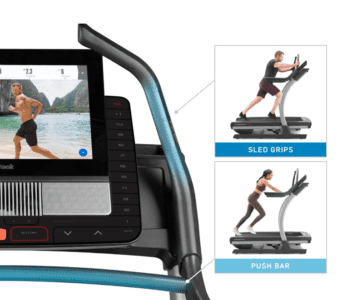 Besides the intense incline workout, the NordicTrack Commercial x22i also comes with industry leading interactive technology in the form of iFit. This program will help you set goals, track your progress, and let you work out in exciting virtual locations around the world. MID-WEEK SALE ENDS THURSDAY: The NordicTrack Commercial X22i Incline Trainer is priced at $2,999 with FREE Shipping and 1-year FREE iFit Membership. Financing is available. Also see the NordicTrack x11i Incline Trainer. 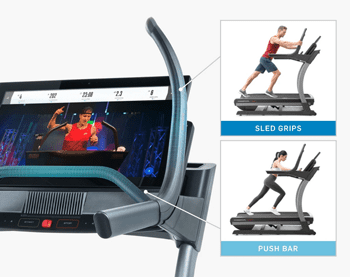 22″ Smart HD Touchscreen – This is the largest touchscreen we’ve ever seen on a treadmill. At 22-inches, it provides a totally immersive experience. Using the iFit Coach Plus technology, you can view landscapes around the world while you work out. GoogleMaps also lets you observe the street view if you choose a more familiar route. The machine will sync to your route’s terrain with increases and decreases in incline percentage. You can easily switch between your workout route and your stats with the easy swipe of a finger. 4.25 Continuous Duty HP Motor – This is the same monster motor that is found on the X11i. It will easily handle almost all users without straining. 22″ x 60″ Treadbelt – A 60″ belt is not uncommon in this price range, but you should take notice to the width. This is an extra wide belt that will make your exercise service feel spacious. Ability to Incline and Decline – The x22i goes from -6% all the way up to 40% incline. A decline feature is attractive because it lets you better simulate both up and down hills while you work out on virtual courses. Plus, this helps you target additional muscles in your lower body. Create custom workouts that are geared towards your personal goals. Some of the workouts are led by celebrity trainer Jillian Michaels. These progressive workouts span several weeks and help you see real results over time. Your stats will be shared with your online iFit account so you can track your progress. You can also enjoy other features in the online community such as participating in virtual challenges. Use your iFit account to trace custom routes on GoogleMaps. You will be able to view the street view of your course while you experience real time incline and decline. Or, if you’d rather look at more exotic locations, you can use one of the filmed routes included with iFit. Routes include famous landscapes and foreign cities. Note: This machine comes with 1 year FREE iFit membership so you can test out the features before you pay a subscription fee. 44 Installed Workouts – As with the X11i, this machine comes with 44 programs to keep the boredom out of exercising in place. Warranty – The X22i has a great warranty: Lifetime Frame, Motor, and Deck, 6 years parts & electronics, 3 years labor. A strong warranty is a good indicator of the quality of a machine. Snap Assembly – This machine has “Out of the Box Assembly.” We have not personally tried to assemble this machine, but it is encouraging that the company has taken this issue into consideration. Other Features – Speakers, MP3 input, fan, grip heart rate monitor, wireless heart rate monitor and large 2.5″ rollers. This machine does NOT include a tablet holder. The Commercial X22i takes an already popular machine, the x11i, and adds an enormous 22″ HD Smart Touchscreen. We have been thoroughly impressed with the entire NordicTrack Incline Trainer line. This newest model will provide an even more immersive experience. Best of all, the Icon Fitness employees view the incline trainers as favorites. Of all the options, this is the one that they prefer to use. That says a lot. Remember, the Commercial x22i comes with the addition of the Next-Gen Sled Push feature. The push bar and sled grips give you the proper body placement to turn your treadmill into a weighted sled push. You hold onto the handles in either of the two predetermined locations, put the speed on 1mph and push your way to a full-body workout. There is no doubt that the popular sled push workout is effective. You may also be interested in the NordicTrack x11i for similar quality and a lower price. The NordicTrack X7i was the entry model of their popular incline trainer series. This model has since been permanently discontinued. You may want to check out the popular x22i Incline Trainer instead. The incline trainers have received notoriety from their exposure on the realty TV show “The Biggest Loser”. Excessively overweight individuals use them to burn calories under the instructions of Jillian Michaels. I consider the incline trainer to be primarily a walking machine. It can be used for running, hospital but the positioning of the console and the limited length of the belt makes it better for walking. Now you might think that jogging or running is a more efficient method for losing weight. However, with the NordicTrack X7i you can crank the incline up to 40%, and if you have ever hiked a steep hill or mountain you know how strenuous that can be. The NordicTrack X7i Incline Trainer is permanently out of stock. It is replaced by the x9i Incline Trainer. It is replaced by the x9i Incline Trainer. Below are stats that show the benefits of incline training when walking at 2 mph for 20 minutes at various degrees. In addition to providing an intense workout, the incline trainer is less stressful to your joints since you are walking and not running. When you run you apply as much as 2.5 times you body weight during the impact of your foot hitting the surface. That is abusive to your joints. With walking there is less impact, and with the incline trainer the deck is angled to meet your step and further reduce stress. 40% Incline — I’m a runner, but whenever I am on a treadmill I like to crank up the incline, walk and sweat bullets. Treadmills max out at 15%. The NordicTrack X7i lets you increase the incline to 40%. Most of you won’t be able to sustain your workout at 40%, but even at 20% or 25% you’ll feel like you are hiking up the Himalayans. 3% Decline — You can simulate going up and down hills. The advantage is you work different lower muscles when you stride up and down inclines and declines. 22″ x 60″ Treadbelt — You get a long 60″ length that can accommodate long strides. The 22″ width provides an extra wide comfort zone when walking on the Incline Trainer. iFit Live Compatible — At an additional cost you can make the X7i interactive with iFit.com and Google Maps. Through iFit.com you define your profile and set your fitness goals and iFit live will download personal workout that control the speed and incline of the machine. You also will get audio coaching from fitness professionals like Jillian Michaels. There are a number of additional interactive program through iFit.com that can assist you in reaching your fitness goals. In addition to customized workouts iFit Live can interact with Google Maps. You can defines routes on Google Maps and the NordicTrack X7i will simulate the terrain by increasing or decreasing the incline. I have no idea how they do that, but it is a cool concept. You can visual the route through Google Maps either by a map, street or satellite view through the use of a laptop or tablet. Speakers and MP3 Input — If all you want to do is exercise to your favorite tunes, the Xi incline trainer has built-in speakers and the ability to plug-in your iPod or MP3 player. The sound is not bad considering. “Snap Assembly” —NordicTrack claims that the X7i requires half the time to assemble. I cannot confirm that, but typically it takes up to 2 hours to put together a treadmill, so any simplification will be appreciated. 2.75″ Rollers — The larger the rollers the better. Large rollers can decrease the noise level, and reduces wear and tear to the belt, motor and bearings. They are solid and stable machines. They provide an intense workout. They lessen the impact to your joints. Overall, the design is a winning concept, and that is why their various models are so popular. Of course, their exposure on “The Biggest Loser” helps. The additional features found on the X7i include the 3% decline, iFit Live compatibility, extra wide treadbelt and the snap assembly. These are the features that justify the premium cost. Is it worth it? If you feel these add-ons will further motivate you to attain your fitness goals, then it is worth every penny. The NordicTrack X7i incline trainer offers a low impact and efficient way to burn calories and get in shape. In addition, it has some of the most intriguing motivational features found on any fitness equipment. This treadmill is one of my personal favorites.